NASA will announce new discoveries about strange, super-dense spinning stars called pulsars on Thursday (Nov. 3). The space agency will hold a press conference at 2 p.m. EDT (1800 GMT) on Thursday to discuss the new findings, which were made with the help of NASA's Fermi Gamma-ray Space Telescope, officials said in a media advisory. 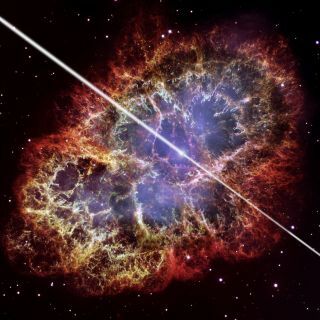 Pulsars form when massive stars die in supernova explosions and their remnants collapse into compact objects made only of particles called neutrons. When a mass weighing as much as the sun is packed into a tiny space the size of a city, the conserved angular momentum causes the resulting neutron star to spin very rapidly, and to emit a ray of high-energy light that sweeps around like a lighthouse beam. Astronomers can detect this light, making a pulsar the closest thing to a black hole that scientists can observe directly, officials said. Some pulsars spin at tens of thousands of revolutions per minute, faster than the blades of a kitchen blender.